This cake has been adapted to be gluten-free however may also be made with gluten all purpose flour with no other substitutions. It's an easy recipe with flavors of orange and chocolate, and light notes of cinnamon and cardamom. It's a fun cake all year round. Preheat oven to 325 degrees. Grease and flour the bundt pan. In a medium mixing bowl whisk together the flour, baking powder, cinnamon, cardamom, and salt. Using a large grating blade in a food processor, or a large hole manual grater, grate the zucchini (will yield 3 or more cups). Wrap the shredded zucchini in a thin, clean kitchen towel, or 2 layers of paper towels and squeeze out any excess moisture. In a large mixing bowl stir together the eggs and sugar. Stir in the melted butter, zucchini, orange juice and zest. Stir in the flour mixture to fully combine. Stir in the chocolate chips to fully incorporate. Spoon into the prepared bundt pan. Bake for 1 hour or until an inserted toothpick comes out clean, the top is golden and the cake has begun to separate from the sides of the pan. Place pan on a cooling rack for 15 minutes. Turn out onto the cooling rack and allow the cake to fully cool. NOTE: if the cake does not easily release when turning onto the cooling rack, slide a pliable plastic knife or small spatula around the edges and try again. Combine all ingredients in a medium mixing bowl. Whisk to fully combine and remove any lumps from the confectioner's sugar. The glaze will be the consistency of honey. Drizzle over the top of the Bundt cake. Allow to set before serving. 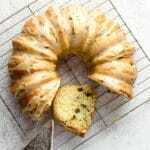 TIP: Place the Bundt cake on a cooling rack on a rimmed baking sheet before adding the glaze. This allows excess to drip into the baking sheet.